On March 10, 2016 was opened the exhibition “Armenia. Legend of Existence” in the State Historical Museum of Russia, where are presented via 160 exhibits the history of the Armenian people and cultural values to the Russian public by three major museums of Armenia: Mesrop Mashtots Matenadaran, the History Museum of Armenia and the museum of Mother See of Holy Echmiadzin. 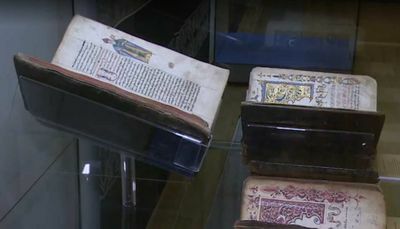 The twenty-five manuscript units exhibited by Matenadaran best present to the visitors the Armenian book art history. At the exhibition “Armenia. Legend of Existence” of Moscow’s Historical Museum the visitors can see the (Avetaran) Gospel of 1053 adorned by Sandghkavanetsi, the (Avetaran) Gospel of Cilicia of 1330 with rich miniatures, the Holy Bible (Astvatsashunch) of 1337, painter Sarkis Pitsak, written for Catholicos James II, the Holy Bible (Astvatsashunch) of Bologna of 1368, the Lectionary of Arjesh (Jashots) of 1460, the Synaxary (Haysmavurk) of 1685-87, which also contains among its rich miniatures the image of Gregory the Illuminator. Among the submitted manuscripts there is also the Hymnal (Sharaknots) of 17th century, where is displayed the image of the Virgin Hripsime.